Have you ever worked somewhere that didn’t feel right? Perhaps the culture was more relaxed than you were used to, or maybe the environment had more of a hands-off feel than you preferred. If you have been in a work environment that didn’t mesh well with the way you prefer to work, then you understand how important it is for a company to consider cultural fit when hiring. ERE.net stresses the importance of good cultural fit and how it is connected with a more positive work environment and happier employees. When you have employees who fit in and enjoy their job, you will have a more successful business. This makes hiring for cultural fit of key importance and all businesses should consider how to incorporate this into their hiring process. When understanding the importance of cultural fit, you should take the time to consider 3 important items before hiring. Before you can ever determine if someone is a cultural fit, you need to first determine the culture of your business. Is your culture relaxed or more formal? Is it team oriented where employees are constantly interacting, or is it the type of environment where employees are working independently more often? These are all key questions to consider when identifying your company culture. Once you have determined your culture, you will then need to consider the type of employee that will be most successful in your environment. If your culture is very team oriented then you will want an employee who enjoys working with others in order to get the job done. On the other hand, if your culture is more independent with little interaction between employees, you will want to hire someone who enjoys working alone. After you have determined your culture and the type of candidate who will be most successful in your culture, you will then need to establish the right questions to ask during the interview process. This is a key factor in hiring for cultural fit. When you ask the right questions, you can ensure that the candidate you hire will fit in and enjoy working on your team. What type of management style do you prefer? What kind of environment did you work in previously and what did you like / dislike about it? How do you communicate with your coworkers? What does “teamwork” mean to you? Listen carefully to the candidate’s responses to determine if they are being truthful and sincere. Watch out for candidates who try to answer vaguely, without telling you their likes or dislikes when it comes to previous environments they have worked in. I guarantee the candidate has a preference when it comes to the type of culture they work in and you want to get a good feel for that. After you have interviewed the candidate and you feel that she will fit in, NEVER skip checking references. When you are checking references, be sure to ask questions surrounding the type of work environment the candidate has worked in and the type of culture she works best in. Checking references can help you to clarify the responses you received from the candidate during the interview process, as well as give you piece of mind when it comes to cultural fit. 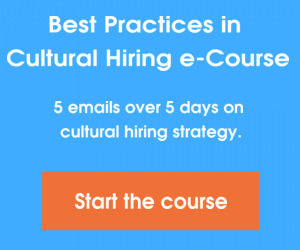 How have you modified your interview process to ensure the right cultural fit? Please share your comments below.